What Superhero Should Drive a Ford GT? Captain America! 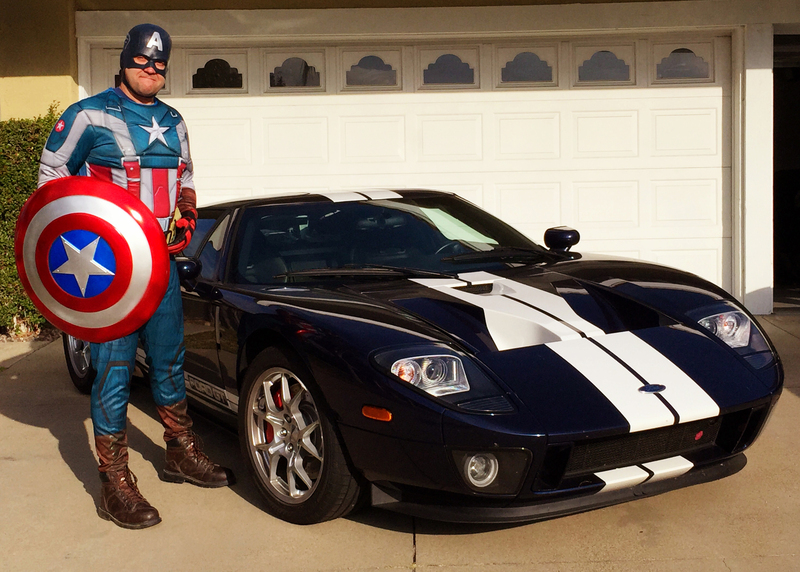 Does any car better fit Captain America’s mojo better than a Ford GT? As a Halloween “treat” I’m willing to post an image I normally wouldn’t share widely. But this shot turned out really well, mostly because the Ford GT diverts attention from me, so here you go. When I dressed as Captain America for Halloween a couple years ago I had no plan to drive the Ford GT. In fact, I was going to drive the used 2009 Porsche 911 Carrera S I owned at the time. Then it occurred to me: “Captain American in a Porsche 911, while a Ford GT sits in the garage? !” I quickly broke out GT and captured this shot before hopping in the American supercar.